These resources relate mainly to Western traditions of herbal medicine (also referred to as phytomedicine, herbal medicine or botanical medicine) that rely primarily on the use of single herbs. Other traditional systems of medicine, particularly Asian traditions, use many herbs in synergistic mixtures or blends. Examples are Traditional Chinese Medicine, Ayurvedic, and Tibetan. They are not covered in the following listings. Note our Resource Guides on Ayurvedic, Tibetan medicine, and Traditional Systems of Medicine. We are just beginning to understand the complexities of herbal medicine, with its multiplicity of active chemicals in a single herb, and the interaction of a mixture of herbs found in traditional therapies. Previously, scientific research relied on the drug development model, which focused on a single compound and mode of action. In order to effectively research whether herbal medicine is effective or even safe, we need to detect all the active chemicals that exist in a medicinal plant, but also evaluate their effects on humans individually and together. We need to know whether the production process changes the chemicals; whether these compounds interfere with each other or with other drugs; and if our current technology can accurately measure all of the potential chemicals that may play a part in the effectiveness of an “herbal drug”. Herbal growers, manufacturers, researchers, medical clinicians, funding agencies are all part of the panoply of actors involved in the making of safe and effective herbal medicine. As demand for alternative medicine has grown, so have the harvesting and collection pressures for numerous ecologies that produce the medicinal plants of interest. The largest impact on the availability has been the loss of habitat worldwide. In conjunction with loss of physical resources, many aboriginal societies who have maintained vast and important bodies of knowledge about the identification and use of medicinal plants are being lost as well. Both physical habitat and ancient knowledge, once lost, will be gone forever. An educated public is the best hope for influencing governmental decisions that will have far reaching implications. The resources are selected and categorized to help you with your own research or background reading so you can become an intelligent, educated consumer not only of herbal products but, equally importantly, of information. Ultimately, together we will influence not only the quality of herbal medicine available to us in stores, but also whether we will maintain the diversity of plant life necessary to sustain a diversity of cultures and alternative methods for maintaining good health. The Institute for Traditional Medicine and Preventive Health Care, Inc. (ITM), is a non-profit 501(c)(3) organization established in 1979, incorporated in 1983, and moved to its current head office in 1988. ITM was founded by and is directed by Subhuti Dharmananda, Ph.D. Traditional medicine refers to ideas, experiences, and substances that have been handed down generation to generation from ancient times, where the origins are obscure but where the continuity of basic understanding has been assured by a formal structure. Among the primary traditional medical systems still active today are the Chinese, Tibetan, and Indian (Ayurvedic). ITM enriches the lives of people seeking traditional medicine knowledge and services by clarifying the nature of traditional medicine and demonstrating how it can be utilized in the modern setting. It operates two clinical facilities, the Immune Enhancement Project (IEP) and the An Hao Natural Health Care Clinic (An Hao). IEP is a low cost treatment center providing acupuncture, Chinese herb therapies, and Zen shiatsu primarily for patients with serious ailments (such as cancer and HIV) that can clearly benefit from effective adjunctive therapies, though all are welcome so long as they follow program protocol. IEP serves as a charitable outlet for ITM’s clinical activities. An Hao is a mixed therapies clinic offering naturopathic medicine, acupuncture, chiropractic, Zen shiatsu, Chinese herbs, and modern medicine. It is a demonstration clinic that illustrates a potential new model for integrative health care. In addition, ITM provides consulting to other clinics that wish to follow the presentation method or the therapies that are available at these clinics. Selected students at local acupuncture colleges, particularly of the Chinese medical department of the National College of Naturopathic Medicine, can get advanced training at these clinics. It provides numerous educational materials, primarily articles written by Subhuti Dharmananda. Currently, over 2,000 pages of such articles are in the ITM archive. Dr. Dharmananda provides free consulting to practitioners who are members of the START Group, to aid in their understanding of herbs, issues related to traditional medicine, individual patients, and practice methods. Chinese Medicine, the official journal of the International Society for Chinese Medicine, is an open access, peer-reviewed online journal that encompasses all aspects of research on Chinese medicine, provided the material, methods, results, and conclusions are evidence-based, scientifically justified, and ethical. Areas of interest include herbal medicine, health food, clinical nutrition, acupuncture, Tui-na, Qi-qong, Tai Chi Quan, energy research, medical education, cultural exchange, and technical translation. Chinese Medicine is a credible channel to disseminate unbiased scientific data, information, and knowledge in Chinese medicine to researchers, clinicians, academics, and students in Chinese medicine, integrative Chinese-Western medicine, complementary and alternative medicine (CAM), and related biomedical fields. Journal of Ethnobiology and Ethnomedicine is an open access, peer-reviewed, online journal that aims to promote the exchange of original knowledge and research in any area of ethnobiology and ethnomedicine. Journal of Ethnobiology and Ethnomedicine invites research articles and reviews based on original interdisciplinary studies on the inextricable relationships between human cultures and nature/universe, Traditional Environmental/Ecological Knowledge (TEK), folk and traditional medical knowledge, as well as the relevance of these for environmental and public health policies. Chemicals and activities in a particular plant. List chemicals and activities for a plant. Plants with a chosen chemical. Activities of a chosen chemical. List activities and plants for a chemical. List common activities (synergies) for a list of chemicals. Plants with a specific activity. Search for plants with several activities. Chemicals with a specific activity. Lethal dose (LD) information for a chemical. Search for plants/chemicals with one or more activities. Search for plants/chemicals with a superactivity. Ethnobotanical uses for a particular plant. Plants with a particular ethnobotanical use. Ethnobotany Research and Applications is an electronic, peer-reviewed, multi-disciplinary journal devoted to the rapid dissemination of current research. Manuscript submission, peer review, and publication are all handled on the Internet. The journal seeks manuscripts that are novel, integrative and written in ways that are accessible to a wide audience. This includes an array of disciplines (biological and social sciences) concerned particularly with theoretical questions that lead to practical applications. Articles can also be based on the perspectives of cultural practitioners, poets and others with insights into plants, people and applied research. Photo essays, methodology reviews and theoretical discussions are also published. The journal publishes original research that is described in indigenous languages. We also encourage papers that make use of the unique opportunities of an E-journal: color illustrations, animated model output, down-loadable models and data sets. Ethnobotany is the study of how people of a particular culture and region make of use of indigenous plants. Ethnobotanists explore how plants are used for such things as food, shelter, medicine, clothing, hunting, and religious ceremonies. Photo by Mark Tuschmanii, 1996. Natural Product Reports is a critical review journal which stimulates progress in all areas of natural products research. The journal covers all areas of natural products research including isolation, structural and stereochemical determination, bi…..
Marine Drugs (ISSN 1660-3397; CODEN: MDARE6), the leading open access journal on the research, development and production of drugs from the sea, including marine natural product chemistry, is published by MDPI online monthly. Pharmacognosy Research [ISSN: 0974-8490] [www.phcogres.com], a new Quarterly journal published as supplement to Phcog Mag. It provides peer-reviewed original research articles from the field of Natural Products. The journal serves an international audience of scientists and researchers in a variety of research and academia by quickly disseminating research findings. In addition, the articles are being indexed by all major biomedical abstracting databases along with Phcog Mag. The Editorial Board of Phcog Mag. received many requests to provide a means for rapid publication of short papers of timely interest. The challenge for this Journal is to meet this need for rapid publication without sacrificing the quality of the reviewing process for which the Journal is known or changing the basic function of the Journal in providing for in-depth studies of medicinal plant research. Pharmacognosy Magazine (Phcog Mag.) 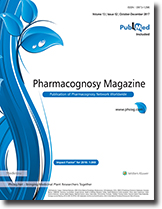 is Published Quarterly, Pharmacognosy Magazine (Phcog Mag.) serves the need of different scientists and others involved in medicinal plant research and development. Each issue covers different topics in natural product drug discovery, and also publishes manuscripts that describe investigations, clinical reports, methods, techniques and applications of all forms of medicinal plant research and that are of broad readership interest to users in industry, academia, and government. Phcog Mag. is a must-read magazine for medicinal Plant researchers —and it’s an Open Access Publication. Ethnobotany Research and Applications is an electronic, peer-reviewed, multi-disciplinary journal devoted to the rapid dissemination of current research. Manuscript submission, peer review, and publication are all handled on the Internet. The journal seeks manuscripts that are novel, integrative and written in ways that are accessible to a wide audience. This includes an array of disciplines (biological and social sciences) concerned particularly ……..
Chemistry of Natural Compounds publishes reviews and general articles about the structure of different classes of natural compounds, the chemical characteristics of botanical families, genus, and species, to establish the comparative laws and connection between physiological activity and the structure of substances. The broader theme of the journal is “Plants, Man and Health” and the objective is to disseminate more valid information on tropical medicinal plants to all those who are concerned with the subject. Articles on subjects of tropical interest are also welcome. The journal will be published in English twice a year initially, in June and December, in one volume with two numbers. The numbers in each volume will be increased if there are more number of papers submitted and accepted for publication. Reviews on books published and summary reports on the conferences, symposium and seminars conducted on medicinal plants will be included. Free Radicals and Antioxidants [www.antiox.org], is a new journal published by EManuscript Services on behalf of SciBiolMed.Org and Phcog.Net. It is a peer reviewed journal aiming to communicate high quality research articles, short communications, and reviews in the field of free radicals and antioxidant biology. The journal aims to further research into the physiological, pathobiological, functional and therapeutic implications and applications of free radical biology and antioxidant agents. The Journal welcomes original contributions examining various aspects of the biological role of free radicals through in vitro, in vivo and animal model studies. Physiological mechanisms of generation of free radicals in healthy tissues, pathological alterations in free radical generation (and degradation) in various disease states. Specifically, the mechanisms underlying these processes, including effect on gene and microRNA expression, morphology, cellular functions (such as cell survival, cell death), body processes (e.g. immunity and cancer surveillance) will be addressed. The role (beneficial and potentially harmful) roles of antioxidants in health and disease will also be examined. Pharmacological agents affection level of free radicals and antioxidants and their effects assessed by in vitro and in vivo analysis will also be covered in the journal. Free Radicals and Antioxidants is dedicated to publishing novel, original findings in the field of free radical biology and both natural and synthetic antioxidants. Free radicals, which are defined as molecules containing one or more unpaire electrons in their outmost atomic or molecular orbital have emerged as double edged swords. Recent research has revealed that they can be both benefecial (e.g. in microbicidal activity inside neutrophils) or deleterious (e.g. lipid peroxidation and membrane damage). Reactive oxygen species (ROS) and reactive nitrogen species (RNS) are the two major classes of free radicals. The generation of these reactive species is tightly controlled by enzymes like nitric oxide synthase (NOS) and NAD(P)H oxidase. Mechanisms exist inside cells that both generate and protect against ROS-induced oxidative damage. This equilibrium, termed as “redox homeostasis” is vital for the health and continued survival of the cell. The Free Radicals and Antioxidants Journal aims to foster the dissemination of scientific information by publishing manuscripts that provide new insights into the biology of free radicals, including their generation, degradation, modulation, role in cellular function and cell signaling. The submission of uninvited expert reviews and research articles in all areas of Free Radical Biology and Antioxidants are also welcomed. Free Radicals and Antioxidants publishes full research papers presenting original, high quality research, critical review articles providing comprehensive analysis of research development within a defined area and editorial commentaries on key topical issues in Free Radical and Antioxidant Biology. Free Radicals and Antioxidants, is a new journal published by EManuscript Services on behalf of SciBiolMed.Org and Phcog.Net. It is a peer reviewed journal aiming to communicate high quality research articles, short communications, and reviews in the field of free radicals and antioxidant biology. The journal aims to further research into the physiological, pathobiological, functional and therapeutic implications and applications of free radical biology and antioxidant agents. The Journal welcomes original contributions examining various aspects of the biological role of free radicals through in vitro, in vivo and animal model studies.